Generally, the more you practice, the more likely you are to have a clean and ethical shot. Many hunters believe in hay bales but actually, they are not the best archery target as the fletching may be damaged when the arrows get buried too deep. Therefore, I’m pretty sure that all most all bowhunters have been puzzled over which archery target to choose at some point. Don’t worry, today I will show you how to choose a good archery target so that you can take your practice to another level. If you are still wondering why you need to get an archery target, then here is why. Remember that continuous improvement of technique, as well as practice, can make a great bow hunter. Honestly, this is the only way to get better at shooting, even when you were born for this. As I said earlier, many of you may choose hay bales but they’re not a good choice at all. Why, because with hay bales, you will never know how the arrow would hit the animal in real life. Also, they are not accurate at all as there is no bull’s eye at the center of the target so it’s difficult for you to figure out how good or bad your shot is. I agree that while they can work in a pinch, you still need to buy a quality target which is specifically designed for the purpose of practicing. Of course, you have to spend some money but it’s worth it because obviously, a good target can replicate what you may see in the field. A circular target or a plate can help you develop the basics on shooting as well as hunting. On the other hand, a 3-D version allows you to practice with real-world elements, such as the size of the target or the angle of the shot. Furthermore, almost all archery targets are quite easy for hunters to carry around, therefore, allowing you to practice in as many environments as you want. Besides, the diversity of an archery target is amazing and you can find one that fits any situation you need. 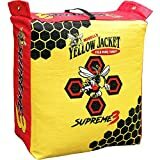 This is the most basic type of archery targets, therefore, almost every bowhunter has practiced on a bag target at least once in their life. Overall, bag targets contain a synthetic fiberfill, which can stop your arrows easily, provides easy arrow removal. However, the downside of this type is that it is only effective when used for field points. Broadheads are likely to get buried in a bag target and they can definitely shred the outer covering which contains the fill. Therefore, avoid using broadheads on a bag target. Furthermore, if you fail to keep a bag target out of the elements or maintain it properly, it will deteriorate quickly sooner or later. Nowadays, a lot of new models are more durable than previous versions with weather resistance. It’s very suitable for hunters to practice on an indoor range or wherever the target can be hung in place. This way, they won’t have to haul around a bag target anymore during your practice. You can use any type of compound set up you prefer now but just make sure that you’re using field points only. So many hunters choose this type of repetition in the early summer practice sessions. This is because these targets can hold together effectively. Additionally, they have a large surface so they can accommodate mishaps when you’re sighting in during the summer or even spring. Block targets are quite lightweight so they are very portable and also offer easy arrow removal, especially for light bows. Block targets work by pinching your arrows between foam layers. They use friction in order to stop the momentum of the arrows instead of force. Unlike with bag targets, you can use broadheads to practice with some block targets. However, field points can still significantly increase the life of the block target you’re using. The drawback of this type is that a heavy draw weight can bury the arrows deep enough before the friction can stop them. That will result in a more challenging removal process. Besides, you also have to be aware of the shooting angle. My advice for you is to use a block target outside or wherever you are able to set it up quickly and start shooting at ground level or from a tree stand. Once again, using field points are highly recommended to extend the life of the target. Also, don’t forget that using heavy bows may lead to potential arrow removal problems. As mentioned above, a block target works by pinching your arrows between its layers, thus, you don’t want to shoot through or across the layers. To deal with this problem, it is necessary for you to turn the target so that its layers are vertical instead of horizontal. This way, your arrows will slide between those layers no matter what your shooting angle is. The last type is a 3-D target. These ones are very amazing as they help you prepare yourself for real situations. In details, they come in virtually almost all kinds of animals, therefore, offering us a fun experience. Many 3-D targets feature various overlay options. For example, one of those shows you the vitals on the outside so that you know exactly where the arrow would hit. However, as any other targets, this one also has limitations. Specifically, the foam cores are likely to wear out if used frequently. 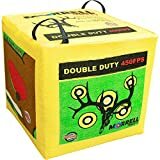 But don’t worry too much because most 3-D archery targets feature replaceable mid-sections which can help extend the life of the whole target. Like with other types, it’s best to use field points when you practice with 3-D versions. Additionally, if you use broadheads, you will probably lose one inside the foam core. Besides, although the targets are light enough for you to set them up quickly in the woods, they’re still heavier than the other types. Of course, it is very suitable for hunters who only hunts 1 animal species so they don’t have to buy more than 1 target. Also, it’s the best to practice with a 3-D model on the outdoor range. Everything you need to do is just set the target up within a good setting. Then start to practice from a tree stand so that you can get ready for the next hunting season. I’m pretty sure that these ones will definitely get you used to shoot much better than any other targets. This is also one of the most important qualities when you’re choosing the best archery target. Because a target will be pierced with a lot of arrows so many times, it must be strong and sturdy enough. Otherwise, you will have to spend money for another one in no time. However, that doesn’t mean the target should be too sturdy. This is because in this case, your arrows can’t pierce it at all and that’s not good for practicing. In fact, depending on the type of the target, there are different options such as cardboard, old clothing, foam, etc. Generally, the foam is the best material for indoor practice as it’s not too sturdy and but more importantly, durable enough for you to practice often. For outdoor practice, you can choose plastic because it’s strong enough for powerful bows. Anyway, just making sure you check the material’s density of the target you’re going to buy. This way, you will know if it is comparable to that of the real flesh of the animal you are going to hunt. This is a basic knowledge if you don’t know, a target should come in a high-contrast color which can be easily seen from far away. For example, the color can be yellow, red, green, blue, orange, and so on. It is not necessary to worry about lugging the target back home every time after you finish your practice, right? That means the piece of equipment should have weather resistance feature. Actually, this particular feature is directly tied to the durability of a target and it does affect the life of the piece you’re using. My advice is just to look for a product made with the highest quality materials. For this, you have to read the product description from the manufacturer or customer reviews to know if it features water resistance or not. And even if your target is waterproof, you still need to secure it carefully since nothing can protect it from the wind. This Genz is one of the most popular targets you can find on the market nowadays. This target was designed by professionals and it can work very well for archers of all levels. The unique layered technology allows for the most efficient and durable archery targets. It measures 18″ x 16″ x 8″. therefore, it’s portable. In spite of the relatively small size, the target is very durable so that it can be your best bet if you’re going to practice often. Remember that this piece of equipment can perform fairly well. And you don’t have to worry about it getting too damaged no matter what type of arrow you’re using. The high contrast design helps improve the visibility and therefore, making this one a perfect choice for your practice. If you are a beginner, then you need to focus on the big spot in the center, on the other hand, if you are more professional, then just aim for small spotters to develop your accuracy. The downside of this item is that it is only perfectly used with bows of 40 pounds of draw weight or less. And in case you’re looking for a bigger bow, then this one may be not a really good choice. This is because it is not able to take the abuse for a long time. Besides, the target is likely to tip over if you try to hit high. But you know, this only offers you more of an initiative for your accuracy. This target provides you almost everything you need expect. It is a little bit bulkier than the previous one, measuring 19x19x19 inches and very durable, therefore, allowing for easy arrow removal. Furthermore, it is able to stop an arrow at a speed of up to 400 FPS. This piece of equipment is extremely durable because it comes with water resistance feature. Therefore, you can leave it outside in any weather without worrying about it getting damaged. Additionally, this one is versatile as it’s designed for the high-speed crossbow, airbow, and compound bow as well. It features easy tote carrying handles so it’s very comfortable for you to carry it around. Furthermore, I really like it because it has 4 different faces so you can easily flip it to another face for standard target shooting. The drawback of this product is that it is not really good at holding up to broadheads. But it can totally last through a few seasons if you maintain it properly. Moreover, people usually complain that the surface of this target is quite narrow. Therefore, if you’re a beginner, then this one is not a perfect choice. Also, do not let anyone sit on the block or it will shrink very quickly after uses. Great for: experienced hunters, all kinds of bows and outdoor practice. My first impression about this one is that it is very simple with the white color. Also, it has different sides with options for archers of any level. In details, it has 2’ square and a large bull’s eye on 1 side which is for beginners. On the other side, there are 4 smaller bull’s eyes which are for experienced hunters. That’s why this product is very versatile so no matter whether you are a beginner or professional, this is a good option. 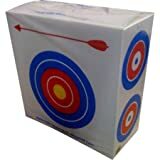 The Polystyrene foam archery target works great with lightweight bows. And it is a perfect choice if you are going to practice for a long time. As mentioned above, anyone can use this target, therefore, so many people buy this for their kids to practice. But what impresses me most is that it is very cheap, to be honest, for $20, you can’t beat the price. It would cost almost that much when you buy a foam sheet, cut it and then bind it into a DIY target, right? However, for $20, you can’t expect something very durable. In fact, you can’t leave it outside as there is no water resistance. Thus, it can’t last for a long time, maybe it’s a week. But remember that for the price, it’s still a perfect choice, you can’t ask more. So, if you’re not going to practice for a long time or not looking for something extremely durable, this can be your best archery target. Great for hunters of any level. There are many different 3D targets available for you to choose on the market. But this one is one of the best. Specifically, the realistic looking buck target has a large but removable core. You can replace the core whenever there is any sign of wear. In addition, this core can show you exactly the exact locations of the vitals, thus, allowing you to know what happens with your shots. Besides, it’s not as heavy as you may think. Instead, it’s quite lightweight and features a handy rod which can be stuck into the ground so you can set it up anywhere you want. Furthermore, the reason why this piece is very popular is the foam it has. Specifically, this foam can not only last much longer but also give more stopping power as compared to other products. It can also stop all broadheads as well as field tip arrows. The downside of this product is that it only allows you to practice with one animal species. Therefore, if you want to hunt more than one species, then you will have to buy more than 1 3-D target. Also, some people complain that after a few rounds of arrows, the insert part of the structure broke. So you may have to use some tape to keep it together if you hit it too hard. Great for: outdoor practice and anyone who only hunts bucks. The last one is the Morrell Yellow Jacket target. Overall, it brings a lot of benefits which cannot be found in its counterparts. First, at only about 23 pounds, it is much easier and comfortable to carry around. Besides, this target features a special internal frame system which helps extend its life. Additionally, it also, the stopping power extends all the way to the edges. That means no matter how your arrow hits the target, it is always stopped. And you don’t have to worry about your arrows getting damaged even if the arrow doesn’t hit the target in the center. More importantly, the reason why this one is commonly used is that it’s truly water resistant. Thus, you can totally leave it outside and the rain will never ruin your target. One more thing I like about this one is that it’s really affordable for an extremely durable target. The downside of this product is that sometimes, it’s difficult for you to remove your arrows. Also, shooting in the same area will definitely reduce the stopping power. Great for: both indoor and outdoor practice. Honestly, it’s not that hard to choose the best archery target for practice, right? Just make sure you consider all the things mentioned above and I’m sure that you can choose what you need. And keep in mind that no matter which one you choose, it’s more important to practice harder and harder to get the results you want.